Hi, Rob, I haven't annoyed you (or entertained - who knows?) in a while, but helium bubbles brought back a memory from my days as a tech in the oil & gas well drilling biz. You might be interested. Up north in Ohio, New York, etc., many oil & gas wells don't need drilling mud; the pressure deep down won't go that high, so they use pressurized air to blow the cuttings out while they drill. Sometimes a little water trickles in, but not enough to where they can't handle it: they add a little detergent to the compressed air and it picks up any water in the hole, turns it to foam, and it blows out of the wellbore easier. Once in New York there was snow on the ground, and my little mobile lab-trailer was near the holding tank where the blown out suds were released. I was walking back to the trailer with a sample of rock cuttings to analyze, when I sensed something - looming - over my shoulder. It was a mass of white foam bubbles from the tank which had broken off in an irregularly shaped mass about 10 feet long and 4 feet thick! About scared the hell out of me; it was about to GET me! I think for an instant I saw a 10 foot snowball about to crush me. Or something. I figured the heat of the earth had heated the foam, and on the cold day the hot foam was just barely above the ambient air in buoyancy. Not to mention that foam is a good insulator so it held the heat for a while. A big slab of foam had just broken from the top of the tank and floated free. Now that colder temps are more likely, perhaps you could simply try some hot air bubbles. I'd start with a tub of water as hot as I could get it, detergent, whatever glycerin is right. 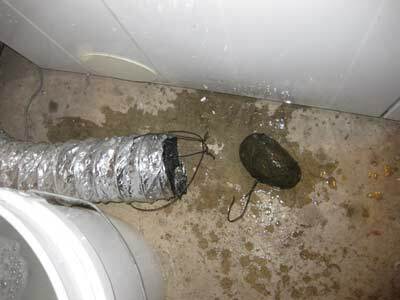 Maybe use a pre-heat tube coil to ensure the air used is also nice and warm prior to making the bubbles. Also, H2O vapor is lighter than air in itself. It doesn't saturate the air enough to make much difference really, however. Mostly it's hot air that will lift the hot foam suds on a cold day. Then again, you're in Cal, it seems, so it may never get cold. And I don't know if a 180 degree F. soap bubble won't pop. I'll help you visualize what happened. A "tank" can also mean a man-made pond. They call them that in Texas, a place I spent too much time. I also have lingering regrets at working in an industry that polluted (and still does though things are a bit better as time goes by). One more note: don't forget my warm foam experience was on a cold winter day, about 27 or 28 F.
Utilizing our clothes dryer was my first idea. The exhaust isn't properly vented outside, so it was easy to pick it up and drop it into a bucket. The end of the hose needed to be submerged, but it was fighting, pushing against the surface of the water. Weighed down with a rock, the escaping air slowed to a burble and stopped. The air pressure seemed robust in open air, but there was no way it could blow past 4 or five inches of water. 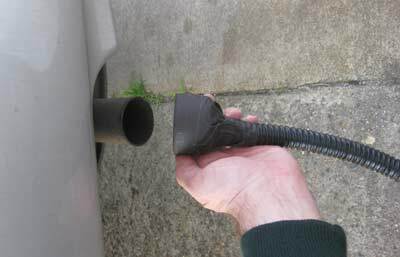 I puzzled over a quick way to keep the exhaust hose at the perfect depth - deep enough to blow actual bubbles, but shallow enough to allow air to escape. I did not come up with anything right away. Aaaand, as an unexpected consequence of this experimentation. I blew the thermal fuse in the dryer. My self-inflicted airflow blockages had resulted in overheated heating elements. The thermal fuse melted, knocking the dryer heat offline. Kind of like how a hair dryer will stop working if you stop it from blowing, only this was permanent. I guess this is a good thing, since this system was designed to stop house fires, but I didn't realize what I had done until later, AFTER the new Kenmore had arrived. My next plan for hot air bubbles was to boil water, and to force the hot steam down and into a reservoir of bubble fluid. I was sure. SURE this would work. This was my "obviously, this will work" plan. However, I couldn't do it inside, and my only outdoor cooking source was a barbeque grill. A small-scale test was in order. With a thrift store teapot and a length of plastic aquarium air hose, I had a sure-fire bubble machine. 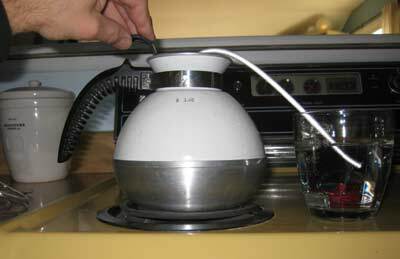 I would need to securely fasten the top to the teapot, but wasn't sure how to go about it. I was a little worried that I was creating a bomb. The plastic hose became very pliable as it warmed up, but remained open enough to allow plenty of hot steam through to the target cup. I had bubbles! But! The bubbles weren't making much impact on the surface. The bubbles were cooling down in the target cup, cooling so much that they returned to their liquid state before they broke through the surface. Hm. I hadn't expected this. Maybe the target cup had to be filled with hot water too. 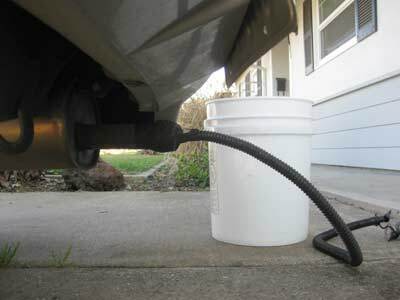 My third plan for harnessing a free source of hot gas was to hook up a hose to our car. After all, when you have already ruined your clothes dryer, why not start experimenting with your car? 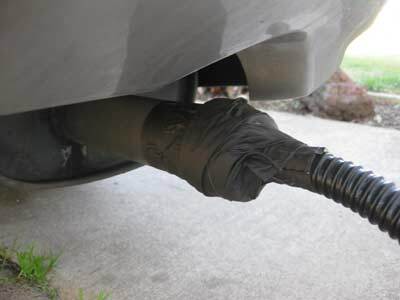 The exhaust pipe was next, and I was somewhat more successful harnessing its power. 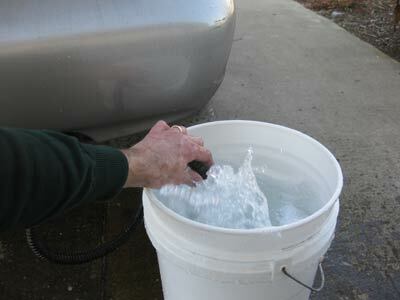 With a 140 HP engine, I figured the Hyundai could bubble up though a few inches of bucket soap. And I was right. 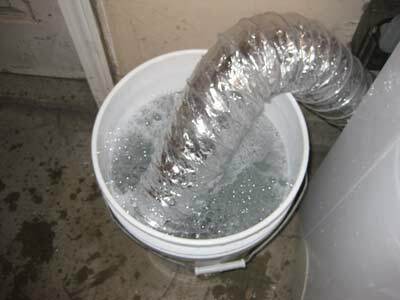 Using the black plastic hose from our pool toy air pump, coupled with a makeshift flange from a broken flashlight, I routed the exhaust into a 5 gallon bucket of water. I was a little shy about doing this outside in the front yard, because it had a rather suicidal look to it. Again weighed down by a rock, air had to push a few inches of water out of the way. No problem. The air blew up into a volcano of water and air. Water went everywhere.